K18 - thermal divining rod? 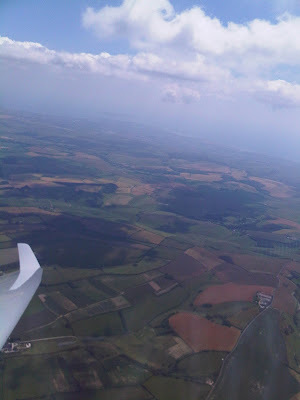 Yesterday, 28th July 2011, the conditions looked good enough for another attempt at a 1 hour flight. To my surprise the K18 had been removed from its unwarranted position at the back of the hangar and was in the air with me next to fly. In I popped, and off we took. Pundits on the ground reported conditions weren't as good as they looked, with sink under the big clouds, and lift either in the blue or under the wisps. Things didn't look great to begin with, there was plenty of bubbles but lots of strong sink under the 'obvious' clouds. As I worked back to High Wycombe I was getting lower and lower. 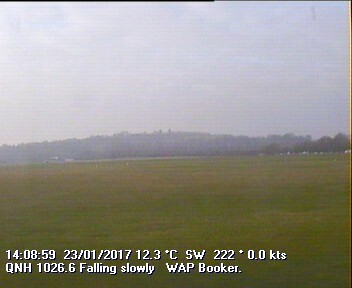 At 1300ft I had to think fast or we would be landing very shortly: I have always noticed regular lift over the dump on the downwind leg, but its too broken to use when you are in the circuit. So this time I said, "Let's see if the lift is useable over 1000ft"... The vario moaned through 4 down sink but then it bubbled and the vario sighed, then gently beeped, and gently beeped some more. With heaps of concentration and flying as efficiently as possible the lithe K18 danced about the sky revealing the secrets of lift and slowly the beeps and lift got more frequent and we were back at 2000ft. The flight was back on! I was in the 2000ft airspace, so it was time to look around for lift elsewhere. Over the town looked the best, and as I drew closer I could see 2 gliders circling in different circles. The sink was strong, but I took a deep breath and aimed for the higher glider at the back of the Cressix Estate, not the closer glider. Whoomp - beeep beepp BEEEPPPP!!!! What a fantastic thermal! The best of the flight, with 4 to 6 knots of lift. That was the first time I've seen the altimeter visibly winding up. At 3000ft over the town, and with seagulls joining my thermal I let out a whoop of joy and gave the K18 a metaphorical pat. Now we had the height to explore the 4000ft airspace and make the flight last longer. The air was encouraging strong thermals. But the tops of the cloud were being capped low. So any clouds quickly grew sideways rather than up, killing the thermals by creating a large shadow, and then their decay brought strong sink before the cycle repeated itself. So as long as you kept yourself on the sunny side of big clouds you could usually find lift by searching. There was a sweet spot in the big clouds where the thermals were stonking - both wide and strong. But if you got the timing wrong you could easily lose 1000ft in the sink looking for lift so it was a bit of a gamble to go under. Interestingly some of my best climbs were blue - whatever lift I was in had yet to condense into cloud. The wonderful K18 with its powers of thermal divination had danced me into thermals often enough to stay up for 2 hours and 15 minutes... Really far beyond anything I expected and it got me back up from 1000ft over the dump one more time before eventually the large cloud over High Wycombe sent all of the local sky into sink and that was the end of the flight. A thousand apologies to the previous pilot who waited patiently for the K18 to land, but he was gallant enough to help me pack the K18 in the hangar at the end of the day. Last night saw about 25 cadets and officers from 332 Squadron Air Training Corps, High Wycombe visit the club to have a general introduction to sport gliding in a GA environment rather than their more normal experience in a military environment. The cadets were initially given a short briefing on gliding and what can be achieved by gliders before taking the cadets out to have a close look at a couple of gliders and one of the tugs in the trailer park. This proved to be extremely popular with the Air Cadets who all had a chance to sit in the gliders and tug after they had been shown around the gliders and introduced to how they work. Thanks to Richard Crockett and Will Hilton who helped make the evening such a success. Woo hoo!!! An evening flight of nearly 90 minutes! What a cracking evenings flying ...again! I took the afternoon off as the RASP predicted conditions would be good. Would it be too greedy to wish for two times one hour flights and get the Bronze legs done and dusted in one day? As I rode along the M40, I saw the silhouette of a K13 near Stokenchurch. "Great", I thought, "Conditions look good. I suspect it will land soon and I can have a crack at 1 hour in the air"... Silly me. 1 hour 30 minutes later with no sign of the K13 landing. We went to the hangar to dig out the K18. The K18 was literally at the back of the hangar so two hangar unpacking beginners pushed, pulled, scratched heads, and swore until the puzzle was solved and the K18 was out. It was nearly 4pm and an overcast sky was blotting out the sun. The K18 was sent up with the more experienced pilot, and I took a launch in the K13 to get familiar with the 35 circuit. The tow was pretty gentle, with little bits of scratchy lift about. These were worked for forms sake extending the flight to 18 minutes. The sky "turned off" when it was my turn in the K18, but frankly I was happy with that. 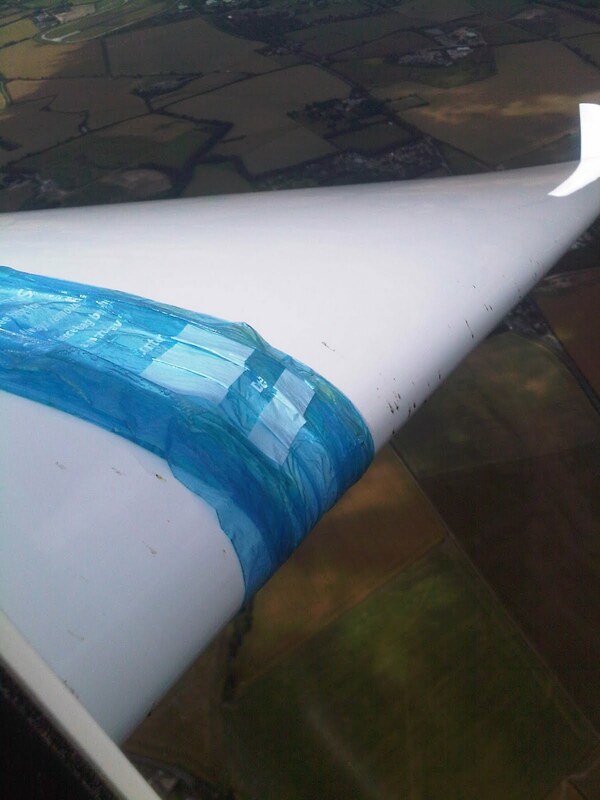 The conditions were great for a glider conversion. Once the K18 popped off the ground I could tell I was in for a treat: What a wonderfully crisp handling glider. It is crisp without being flighty. I really am looking forward to many more hours in that lovely glider. Time was marching by, and with it any chance of a long flight. As the evening group assembled Rob turned up and was quickly dispatched in the K18. There was a gap in the thick stratus cloud slowly approaching Booker through which the sun still looked strong. Rob took a high tow, and looked like he would be in the air for a while. So it was decision time - hang about for the K18, or take the K13 and see if the conditions would allow one last bit of lift. Stuff it - let's have a play in the K13. So we took off at 18:03 into a sky which might just have some gentle evening lift. Roy circled the tug round a promising cloud with lift at about 1600ft. I made a note of the position and hung on a little longer so that I could come back and connect with the lift higher up. At about 1900ft I came off tow and headed back to the cloud. There was definitely lift, but it wasn't that strong and it was tricky to stay constantly in lift. I admit I was starting to get a bit grumpy. I had obviously missed the best part of the day and this was going to be my third, and last, short sled ride of the day. But then I saw Rob in the K18 MUCH higher, and I made a quick bee line under him. Woosh... lift varied from 0 to 2 knots but I was determined to go up. With the glider as close to 40kn as I dared, and lots of bank we were going up! As the lift was quite weak, the gentle wind had blown me back into the 3000ft airspace. Once at the 3000ft I pushed forwards to cross the line of the motorway bridge and Saunderton train station. And joy of joys, I was heading towards a little street of promisingly grey clouds. I had been so busy thermalling, I had forgotten to start my flying timer. I made a mental note to add a couple of minutes to the flight time. As I pushed forwards, the sink was impressive - 6kn down! 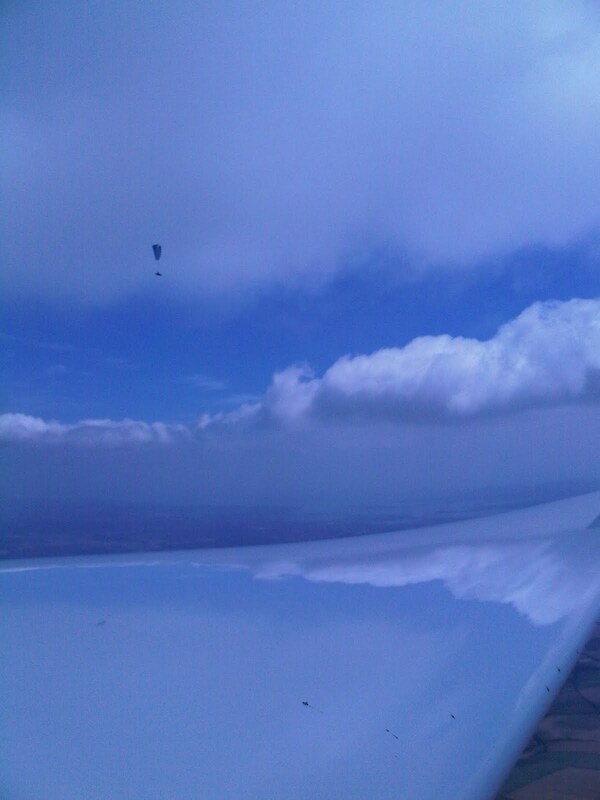 But I persevered and was rewarded by a fantastic 'whoomp' of lift and a 2-4 knot thermal. Up I turned, round and around to 4000ft. By this time I had been in the air for 20 minutes, and I was beginning to think... you know what, with cloudbase well above airspace, I'm at 4000ft, and the clouds in my vicinity look good. Dare I think an hour might just be a possibility? I love the view from 4000ft - it is pregnant with possibility. With the excellent visibility I could see London, Didcot, Heathrow and more. To my left was the airfield, the tarmac runway and large blue hangars making it such an easy landmark, and as I peered to my right I could see the trading estates of Thame and a little to the right Haddenham airfield. The bit of my brain I'm preparing for cross country said, "You know what, you could probably dolphin fly to Haddenham from this height in the K13 against a 5kn headwind". The local sky was filled with little streets of clouds all proclaiming lift that could be explored and topped up. So off I toddled, exploring the lift and practising the art of dolphin flying. Rob had disappeared towards the Hambledon valley whilst I was thermalling lower. As time passed, I kept an occasionally check on my watch - at the 30 minute mark I was still well above 3000ft and I knew this was destined to be my longest flight. As I periodically checked the airfield I saw Rob had landed, but a white glider had joined me much lower down. I was in pretty weak lift at the time, so thought whoever was below was probably finding it very tricky! I think I should put a warning note on the outside of the glider saying, "Early solo pilot - I will turn in any and all lift, no matter how weak!". At 45 minutes, I was jubilant. I was still above 3000ft and the sky still had lift to play with. Unless the sky instantly turned into 10 knots down everywhere, I had got my first 1 hour flight! At the 1 hour 10 minute mark, I thought it was time to come down. They had moved the bus 30 minutes ago, the tug was packed away and I could just make out two cars and a buggy at launchpoint. I imagined somewhere a loudhailer was calling, "Come in EBZ your time is up!" It was after 7pm, the lift was decaying to just hints of zero's so back we went to Lane End. I still had 3000ft to play with, so with a HASSLL check I practiced stalls, and dives followed by tight climbing turns. 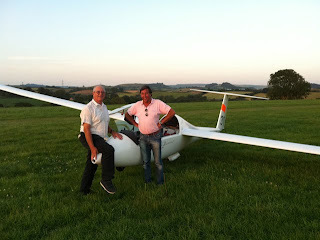 Oh the unabashed luxury of exchanging 1000ft of height for a couple of minutes joy of slinging a glider about the sky! Below 2000ft I had a quick look at the wind sock to see if the wind had changed direction, or strength. It was lighter, but still more or less from the North. Having spent most of the last hour between 3000-4000ft, 2000ft looks very low! And to think on my first flight of the day I was determinedly circling in zero to 1/2 knot lift at 1100ft. We plonked down at 19:30 and to say I was jubilant would be an understatement. Although my knees were killing me, I jumped out of the cockpit and did a dance of joy. I had been in the air nearly 1 hour and 30 minutes, and all of that after 6pm!! It just goes to show if you get yourself in the air often enough, even in the evenings, lady luck eventually comes knocking on your door. I would like to say a heartfelt thanks to those Tuesday and Friday evening volunteers without whom I probably wouldn't find the time to fly: Symeon, Roy, Paul, Graham, Geoff, Robin, Chris and also Richard, Sue, Paul, and Mike. I also have to buy Rob a beer - that's the second flight he's marked a climb that's "got me in the game". I'm going to leave my last paragraph to a fantastic book I'm reading by Ann & Lorne Welch, which I feel most closely captures the emotions of my gliding flight, "It is easy to get an impression of gliding as a sort of aerial pot-hunting.. But that is not true. The challenge... is not to gain a man-made trophy, but to pit skill and intellect against the strengths and weaknesses of the unknown sky - a sort of modern voyage of discovery in which the difficulties, even dangers, which might beset the traveller are unknown. Each flight is different, with moments of deep despair when no lift can be located, and the glider would be in imminent risk of being back on the ground, followed by relief and elation when some tiny scrap of lift was found and worked with care and skill until, once again, the pilot was literally on top of the world." By now, you will all have heard the fabulous news, that WDC have scrapped the stadium scheme. It’s great news for us, as a gliding club, but it is also a great re-affirmation that we live in a democracy and that good politicians listen to their electorate. A big thank you to all of you who did so much to fight the huge threat that the proposal represented. So many of you helped in so many ways, the members of the club committee, the members of the ‘Saving Booker’ Committee and the members of GASP, so ably led by Gary Nuttall, and, of course, all of you, the members and staff, who value Booker Gliding Club, have stuck with us during this tough time and rallied round to energise and maintain the spirit of our wonderful club. We are planning a party to celebrate, club members and GASP supporters keep an eye on your email for details. Breaking - stadium plans axed! 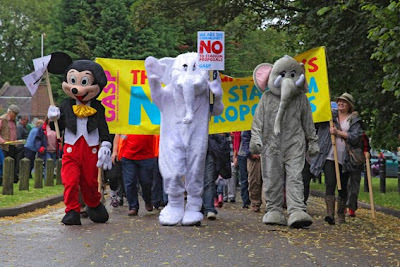 Despite early torrential rain Booker Gliding Club members joined the parade today organised by GASP (Groups Against the Stadium Proposals) aimed at concentrating the minds of Wycombe District Council before their crunch meeting on Monday. Mickey Mouse, who voted for the stadium in the Council's original consultation, has since had a change of heart and came along to lend support. Thursday 16 July looked like it might be a good gliding day over a good part of England, so perhaps a chance to do the boring Gainsborough Bullington 500K again (Not done it for a couple of years). On the morning sat24 showed the reality was slightly different with a mass of cyclonic cloud covering an area from the Wash down to the South coast with a tendency to move westwards. So rapid change to lets go towards the West Country. Eventually deciding on a Booker Bridge- Fordingbridge- Axeminster- Stockbridge-Booker. 373k. Almost ready to go and Jim asked if I’d got a passenger in mind, and to the answer “no” said well I know someone that would like to come I’ve given Bill your mobile number. Before we took off I had suggested to Bill that a landout was always possible to which he replied “It’s all part of the fun”. The run to just short of Axeminster was great and views of the coast around Portland Bill, Sidmouth and Lyme Regis were well worth seeing. Unfortunately Bill’s camera had lost battery power so only our eyes and those of Doug, and Richard have captured them, and as we have no USB port in our heads that is where they remain. The gamble came as we climbed very slowly over Axeminster that a cloud over Bridport looked good so I decided to go for it. Silly me it didn’t work and we were looking for fields. 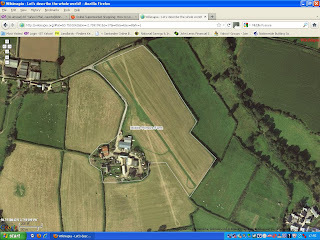 They are quite small in that area although I had spotted 2 fields that would do when Bill said “That looks like an airfield over there” . That was it then so after a few bubbles made us thing we could get away it wasn’t to be. The decision to land being taken we then waited to see if the model about to take off would or not, so when it taxied back to it’s owner in we went. We were made to feel most welcome by the members of the model club especially Howard (who had been the one about to launch) He explained the field was used by the model club and a few micro lights but we were the first glider to land there. Amazingly the model club rent the field for use all year for peanuts. As micro lights also operate from there know to keeps there eyes peeled. The time being just 14:26 it was difficult to get hold of anyone at Booker (they were all still flying) and my phone contacts was woefully short of names. Nevertheless thanks to Graham I was able to get hold of Heggie and then Glyn who eventually managed to organise a retrieve from a choice a people and Geoff Lyons was the stalwart who did the deed. Many thanks must go to Geoff, who having rigged, flown Devizes-Olney and then derigged spent over 7 hours driving. The sight of the trailer driving down the A35 in Bridport at 9oclock in the evening put new life into Bill and I.
Geoff did have a camera that was working and took the following whilst Bill and I were organising the Duo for the trailer. How else can one turn it without a tail dolly? A smile before the heavy lifting. Thanks again to Bill for his cheerful acceptance of the day and to Geoff for an absolute sterling performance on the retrieve. This last week has produced some excellent soaring for local training and cross country flights. Conditions were good for 300's on Monday with J1M, 325 & 944 pilots doing tasks going south-north. It was probably the 'buggiest' day this year (not appreciated by J1M who lost a wiper around Corby). I acquired a rather nasty bug that accompanied me for about 50km before a particularly bad thermal entry finally dislodged it. Dave C came up with a 375km task that avoided all the airspace issues and took advantage of the best of the weather (Booker Bridge, Fordingbridge, Axminster, Stockbridge, Booker) - a long way south and west. 315, A2, 944 and 987 (with Minigat) set off to the south west where the conditions rapidly improved and cloud base rose to 4,500 (eventually over 5,500 later in the day). It was interesting (different?) flying along the second leg with the Dorset coastline to the south so close and the New Forrest underneath. Conditions were clearly very good as there were several paragliders that needed avoiding at all heights. Unfortunately Axminster was in a rather large blue hole and this resulted in Dave C landing out at Lyme Regis. A long retrieve but there are far worst places to spend an afternoon. J1M declared and completed a very creditable 500km topping the club ladder for the day. Chesil Beach and Portland Bill in the far distance. The good conditions continued on Friday with more cross country flying going on - unfortunately I couldn't be there so not sure of all that went on but well done to all who flew (and the others not mentioned from earlier days in the week who achieved something new or just enjoyed the flying they did). Don't forget to support the club at the GASP protest rally this afternoon- we don't want to loose the ability to do what we all enjoy doing. Evening ridge lift or wave? There was some intriguing soaring this evening. The wind was fairly brisk, 15 knots, but it wasn't as turbulent as Tuesday, The thermals were long gone at 7pm but something was definitely happening downwind of the Borstal between 1000 and 1400 feet. 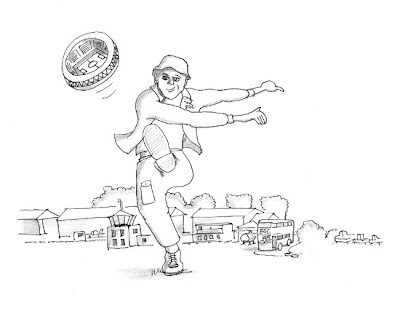 The air would start to bubble and turn into a gentle 'whoosh' of lift. Strangely, the lift was stronger at 1200 feet than it was at 1400 feet. It was also very difficult to stay in if you circled. Could this be a tiny bit of wave, or a dollop of ridge lift? I think next time these conditions re-occur we'll fly along the 'contours' and see if we can stay at 1200 feet by making 'beats' back and forth on our side of the airfield. If it is ridge lift, then we should be able to stay up for ages! Evening flying does make you very determined to stay up - and patient enough to work every hint of lift! There are some gorgeous gliders flying this weekend. Graham's Petrel has to be seen to be believed: The finish, and woodworking is simply stunning. It seemed to take off in 10 walking paces... in fact, when it landed the buggy had to be driven especially slow in case it took off again! Some more vintage gliders about to pop into the sky for a medicinal gin and tonic at 2000ft. Yippee - a 45 minute flight! Past 6pm! The conditions looked great this morning, then the cloud started to blot out the sun as forecast and the afternoon was the only time I had free. But I've learnt very early on, that you get your best fights when you least expect them, so turn up and fly is my motto. If it's a 14 minute sled, so be it: It's still great practice. The sky had been blocking the sun for ages, so I wasn't expecting much of the first flight. The aerotow was lovely and smooth, which was nice, but it didn't promise much lift. Off we pop at 2000ft and trundle back to high key on the look out for lift. There was little bubbles, but nothing positive. Then over high key the bubbles were a bit stronger, and with a little work we were holding station in zero knots lift at 1200ft. I had a poke around for better lift, but that was it. So with a bit of determination I set about staying up as long as possible and although it was modest we turned a 14 minute sled ride into a 19 minute soaring flight! The sun was starting to poke through the cloud just as I was in the circuit, and although it was nearly 6pm I thought it was definitely worth another flight in case this sunshine kicks off some pent-up evening thermals. Another 2 gliders had just taken off and I was having to work much harder on the aerotow as we punched through thermals. As we flew up hambledon valley I could see the wonderful sight of a glider above me circling in lift. Ping... goes the rope. Get the glider lined up on the opposite side of the thermal, going the same way, and yazookks... 4 knots of lift at 6pm! Once I got to 3000ft and the lift kept coming, I was like a kid that has got all of the sweets. Still we turned until I had to pull off as we hit the 4000ft airspace: I felt elated and proud - I knew I had just added at least 20 minutes to my flight, but by the looks of the sky there was a wonderful street of lift to be explored. At the 30 minute mark, it was getting harder to find lift and sink was starting to predominate. So it was time to push back to high key and have a 'poke about' (technical term). Alas, I would only find 1/2 knot down and given that was over hambledon valley elected to call it a day. As I got into the circuit there were 3 gliders strung across the airfield, so it was time to set the reference point a little further up the field, and closer to the bus. Down we plonked. I unclipped, jumped out of the glider and did a dance of glee. I don't know how long the flight had been, but it was definitely my longest. And I had been to 4000ft three times! I am now, very, very fond of CFA.